The spring market is widely known as the best time to buy and sell in residential real estate; however, that market is the result of activity that begins in January. Listing your home in January gives many sellers a huge advantage! A trend we see year after year, website traffic increases by 20% in January - the largest jump in volume from the previous month that happens all year. 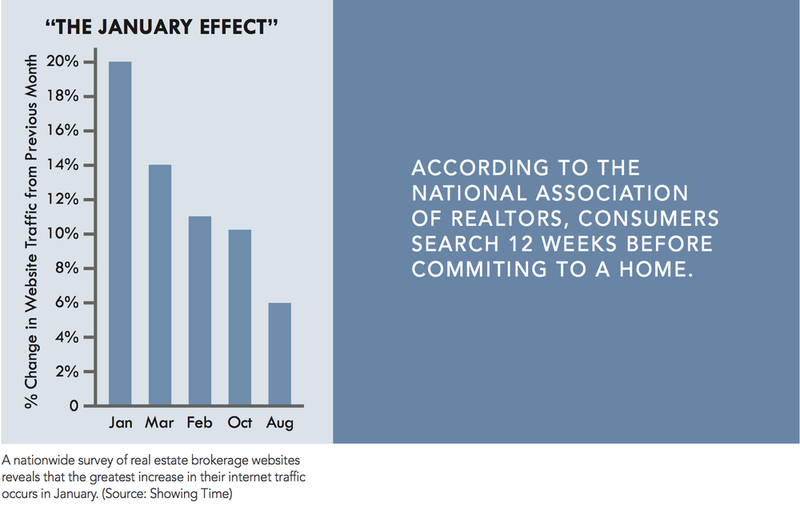 According to the National Association of Realtors, consumers search for 12 weeks before committing to a home. Getting your home on the market 3 months before the competition could mean your house is sold before the others are listed. Take advantage while time is on your side. What can you do? Put your home on the market as soon as possible! Buyers have been waiting and watching the market for new inventory. Listing your home at the right time can be key to selling quickly at top dollar. Why wait? Feel free to reach out with any questions regarding buying or selling your home - I would love to help any way I can!